Are you a Christian, an American, and a Republican? Why? Author Brent Bourgeois sets out to uncover the reason why, when he became a Christian, he instinctively, politically, philosophically, and intellectually turned to the left, when so many of his Christian friends, co-workers, and members of his congregation turned to the right. 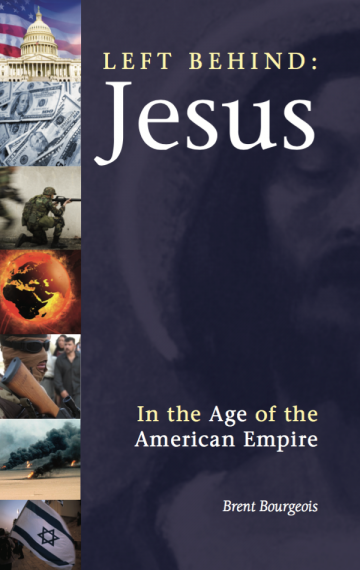 Left Behind: Jesus in the Age of the American Empire takes a unique look at America’s place in the world over the past sixty years, and examines how closely being a Christian fits with being an American. BRENT BOURGEOIS is a highly respected recording artist, song-writer, record producer, music company executive, and founding member of the cutting-edge pop group Bourgeois Tagg. From being managed by rock impresario Bill Graham, to being the lone musi- cian backing an altar call by the evangelist Billy Graham, Bourgeois has acquired a positively unique perspective on American culture. Brent and his wife, Mary Ann, have four children and live in Elk Grove, California.